I had to opportunity to taste a Breaux Vineyards Meritage 2012 in 2018. 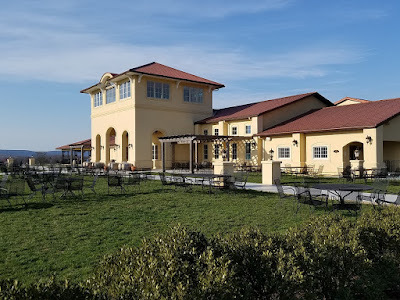 Breaux Vineyards is nestled between the foothills of the Blue Ridge and Short Hill Mountains. The estate has 104 acres of vineyard on 404 picturesque acres of land. Paul Breaux is also the Owner and CEO of Sun Realty of Nags Head, Inc., a real estate company specializing in sales and property management on the Outer Banks of North Carolina. The company has been phenomenally successful. In 1994 the Breauxs acquired a lovely 404 acre site in Virginia that had 3 acres of grapes that were planted in 1985. The Breauxs soon began making hobbyist wines. The Breauxs collaborated with Dave Collins (now of Big Cork Vineyards) to begin producing commercial wines at an even higher level of quality by investing in all new state-of-the-art wine making equipment and using proven vineyard practices, such as planting, harvesting and sorting by hand. In April of 1997, Breaux Vineyards opened its doors to the public. Jennifer Breaux is the Vice President of Breaux Vineyards. Jennifer spent the 16 years prior to joining the Virginia wine industry working in fine dining restaurants honing her palate for quality wine, the foods they pair with, and the role they play in hospitality, sales, and marketing. In 2005 Jennifer took over day to day operations at Breaux Vineyards from her father, Paul Breaux. Since then she has established herself as an industry expert in social media and entrepreneurship, most notably demonstrated by appearances on industry specific online marketing panels. Breaux Vineyards has been making their Meritage from as far back as 2007, and in the last three or four years have offered their patrons special, annual, vertical tastings. The Breaux Vineyards Meritage 2012 is made from 40% Merlot, 40% Malbec, 10% Petite Verdot, 9% Cabernet Franc and 1% Cabernet Sauvignon. The wine has usually spent 18 months in a combination of new and neutral oak. This is a big wine, complete with dark cherry, blackberry, and casssis on the nose and palate.Also knotes of plum and prune. Big notes of spice, earthiness, mocha and cocoa all come across, as well as lots of spices and black pepper. The big dark fruit stew up front slowly morphs into a lovely fruit forward middle, that ends with nice tannins and a lovely mouth feel. This was as impressive a meritage as one will find in Virginia. A lovely, lovely wine!